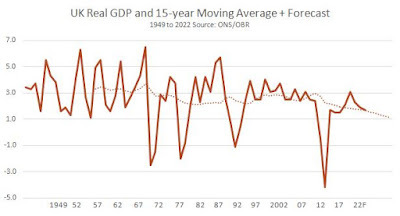 The economic outlook for the UK is the worst it has been in the modern era, the entire post-World War II period. This is not the verdict of some rabidly anti-Tory propaganda. It is based on the UK Treasury’s own forecasts for GDP. 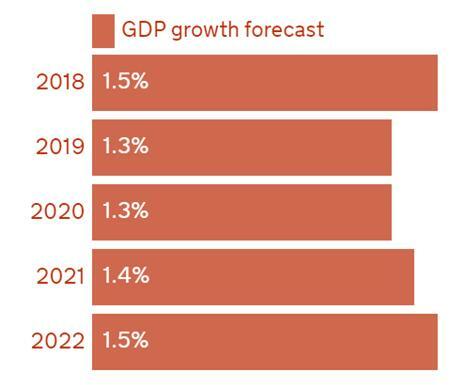 The Treasury’s forecasts for real GDP from 2018 to 2022 are reproduced below, from the Chancellor’s Spring Statement. 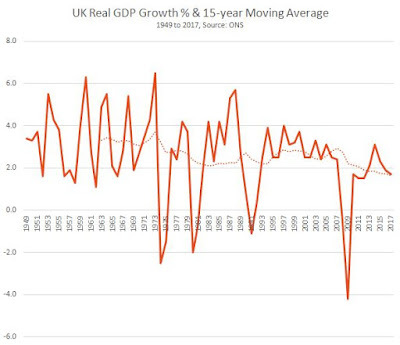 The average annual GDP growth is forecast to be just 1.4% over the period, and growth will never exceed 1.5%. This compares to 1.7% growth in 2017, which was itself significantly below the long-term average growth rate and the weakest since 2012. According to official forecasts, the best of this recovery is already behind us. Over the medium-term, this will be the slowest growth rate of any period in the modern era. 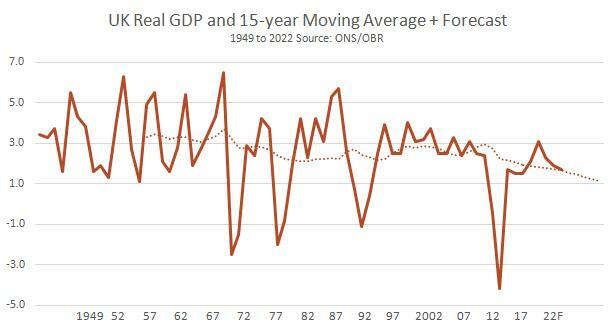 Chart 2 below shows the growth rate of UK real GDP from 1949 to 2017, plus the 15-year moving average. Using a 15-year moving average has the effect of removing the short-term fluctuations of the business cycle. To date the slowest growth rate on this measure of the 15-year moving average is the current one. The average growth rate over the 15 years to 2017 is just 1.7%. 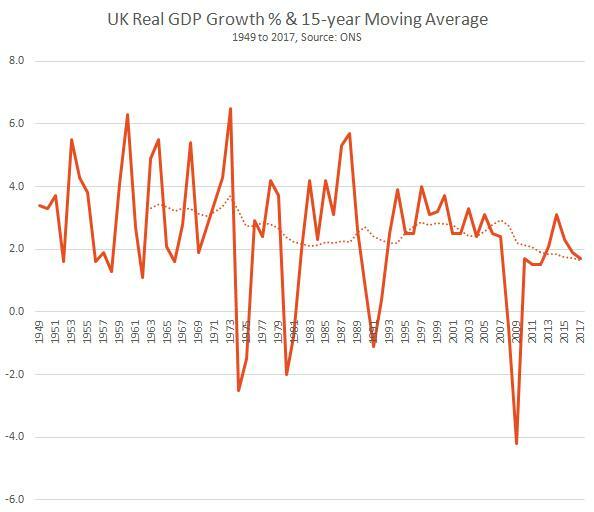 However, if the Treasury’s forecasts for the next 5 years are included then the 15-year moving average real GDP growth falls to 1.2% by 2022. This is significantly below anything that has been experienced in the modern era. This is shown in Chart 3 below. 1.2% average annual growth is exceptionally low. It is half of what had often previously been cited as the trend growth rate of the UK economy of 2.5%. If these forecasts are approximately accurate, they will have severe negative consequences for living standards and for public finances and public services for many years to come. The ‘political centre ground’ will also continue to erode as radical economic and social policies will be sought. The next SEB piece will address the appropriate perspective for ending economic stagnation.